As most drug and alcohol addicts eventually realize, good intentions alone aren't enough to break destructive habits. 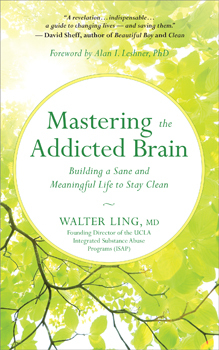 In Mastering the Addicted Brain, however, author Walter Ling, MD, shows that addiction can be managed once its true nature is understood. Without finger wagging or assigning blame, Ling guides addicts and their loved ones through the tortuous path to recovery, offering both encouragement and tips to avoid potential triggers for relapse, such as stress, boredom, and social pressure. Ling begins with a brief, nontechnical description of the brain chemistry of addiction and explains why ingrained habits are so hard to kick. From there, he moves into a broader discussion of behaviors that lead to lasting change, illustrating his belief that recovery is not a one-time event but a way of life. To prevent relapse, former addicts must adopt new routines, new interests, new friends, and a new outlook. Above all, self-knowledge is the key to recovery. As Ling puts it, his program is simply the "neuroscience of common sense."